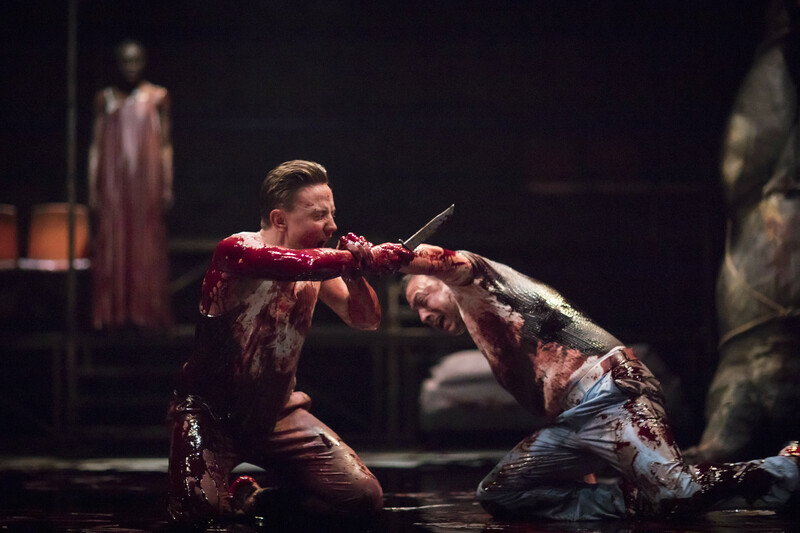 By the end of this production of John Webster’s Jacobean tragedy, The Duchess of Malfi, the stage is swamped in blood. Initially seeping out of a gash in the huge, headless carcass of a beast hanging by its feet behind the action, the blood spreads until it’s tracked into every footprint. None of the characters escapes it, soaking into their clothes and smearing their skin. It’s overwhelming, and it overwhelms Maria Aberg’s staging. The blood is a blunt symbol for the all-corrupting brutality of Ferdinand and the Cardinal, who have their sister, the titular Duchess, murdered because they can’t bear her marrying outside her class. They can’t contemplate her as a human being at all. Webster’s language isn’t pretty or philosophical. The ugly misogyny and victim-blaming that leads to the Duchess’s death is captured in metaphors of rot and filth. Aberg strips everything back and puts it in modern dress. 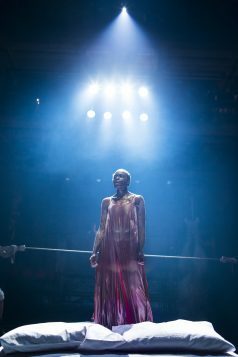 Like her previous interpretations of Shakespeare for the Royal Shakespeare Company, her production pivots on high-impact visuals. 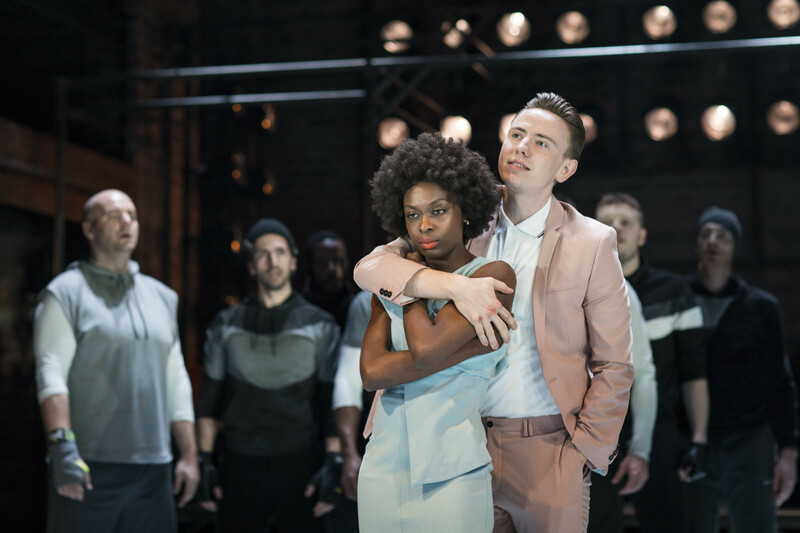 Naomi Dawson’s stark set design is an indoor sports pitch, backed by scaffolding from which a testosterone-pumped ensemble of men leer, animal-like, from the darkness. We first encounter the Duchess dragging that bloody carcass on to the stage, where it stays as both a witness and a warning. There is no higher power here. 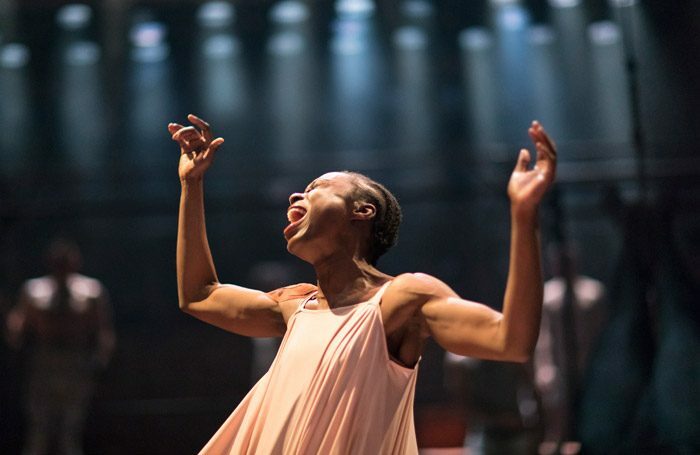 Joan Iyiola’s portrayal is powerful and self-possessed, even in grief. Her laments are like battle cries. Immaculately dressed at the start, she holds herself as her own defence against the world. But she and Paul Woodson, as her awkward, Clark Kent-ish husband, Antonio, also find something achingly vulnerable in an underwritten romance. When they first fall into each other’s embrace, it’s like the letting out of a long-held breath. Elsewhere, Chris New’s Cardinal is a smiling abuser in serial-killer white gloves. 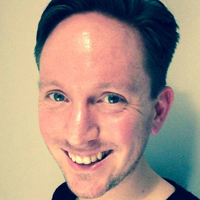 Alexander Cobb is a jittery, spineless Ferdinand whose performance has just a few too many tics. A hoodie-wearing Nicolas Tennant locates the last, strangulated gasp of a conscience in the self-servingly nihilistic Bosola. These are men drenched in guilt and so much blood you can’t help but wonder about the dry-cleaning bill. This is where the production runs into itself, in the clash between the gleeful excess of Jacobean tragedy and all-too-real violence. The murders are viscerally shocking but tonally unsteady. Next to raw grief, seemingly flayed skins (complete with faces) are displayed with the same lurid flourish as something flying out of the dark on a ghost train. In the end, too much gets lost in all the claret, as the production pulls against Webster’s sardonic tone. But in moments like Aretha Ayeh’s extraordinary, grief-numbed rendition of ‘I Put a Spell on You’, an ominous backdrop to the Duchess’s and Antonio’s fleeting happiness, Aberg’s staging finds its own, gut-wrenching voice.